Giant Trance bikes are unbelievably light. Read our review! 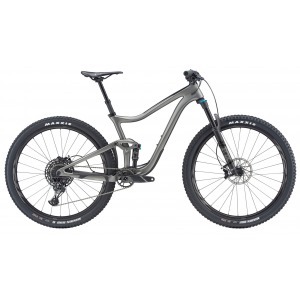 The highly capable and powerful Giant Trance range offers up some choice componentry and geometry for off-road full-suspension mountain bikes at a midrange price tag. With Shimano Deore componentry on the bottom end and SRAM X01 Eagle parts on the top end, these bikes offer something for everyone. Giant has been around since the 70s, so you would expect some well-constructed bikes from this company. They usually deliver some quality work, and these bikes built for off-road performance are no exception. We had only a minor complaint or two about these mountain bikes, but otherwise, they performed excellently on the trails and pavement we tried out. What we were looking for most here was good suspension, and with 140mm Maestro, we were quite pleased. The RockShox forks left a little to be desired though, but the adjustable compression damping comes in handy. At this price range, we would have expected a few better components. Surprisingly, though, the combinations of components used seems to work overall. All the models we tried handled well though most of the trails we took, with some of the lower-end bikes lacking the responsiveness you would need. Higher speed aggression is lacking a little. Overall a good choice of off-road full suspension performance bike with decent specs and comfortable riding. Though the Giant Trance bikes leave us wanting a little more from the componentry at this price range, as well as better responsiveness, we did experience some good speeds and handling overall. Certainly a worthy adversary on the trail.